Time stopped for Dr. Oliver Bogler. For three months he'd felt and ignored a lump in his chest. The thought of breast cancer had crossed his mind, but was quickly dismissed. After all, he was a 46-year-old man. He attributed it to gynaecomastia (a non-cancerous lump in the breast). However as the lump persisted, he saw a physician who recommended further testing. A mammogram, ultrasound and biopsy later his worst fears were confirmed when his doctor uttered the life altering words: "This does not look good." Time stopped for Dr. Oliver Bogler. For three months he'd felt and ignored a lump in his chest. The thought of breast cancer had crossed his mind, but was quickly dismissed. After all, he was a 46-year-old man. He attributed it to gynaecomastia (a non-cancerous lump in the breast). However as the lump persisted, he saw a physician who recommended further testing. A mammogram, ultrasound and biopsy later his worst fears were confirmed when his doctor uttered the life altering words: "This does not look good". 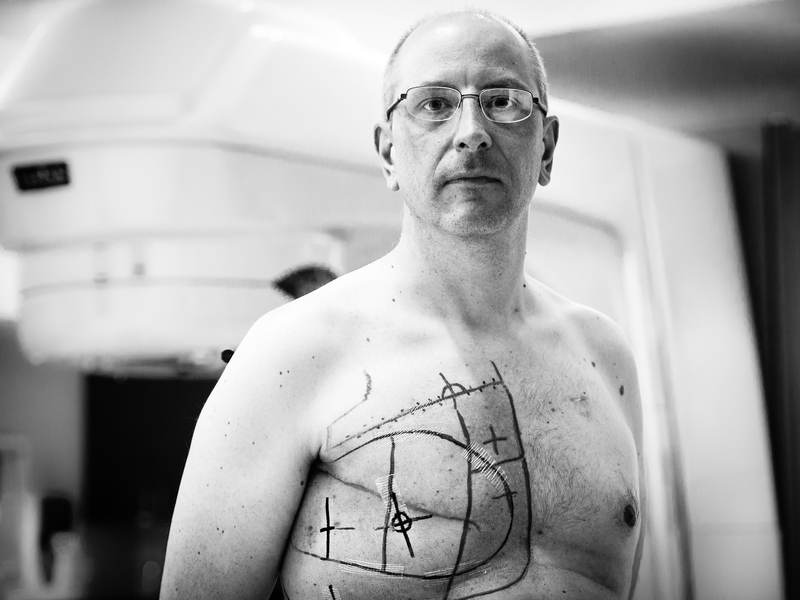 Male breast cancer is not a myth; it is very much a reality. In the US and UK, male breast cancer accounts for 0.5% to 1% of cases. It is a common misconception that as men do not have breasts, they cannot get breast cancer. The fact is that both men and women have breast tissue. The difference is that women possess hormones that lead to further development of this tissue, which is not the case in men. This tissue can give rise to cancer in a similar fashion like it does with women. It commonly presents as a firm and painless lump in the breast, but is ignored by most men. Even though a lot still needs to be done for breast cancer awareness in women, at least there is general knowledge that a lump in the breast can be cancerous. This is not the case as far as men are concerned. Unfortunately, a delay in diagnosis lessens the chance of cure -- the disease is already too advanced. Lying on the ultrasound table, Oliver was filled with a sense of déjà vu. Just four years earlier his wife had been diagnosed with breast cancer. Now, she served as his guide, mentor, friend and companion through his breast cancer journey. The treatment for male breast cancer is similar to that for women -- incorporating surgery, radiation and chemotherapy. This cancer, though, is almost always hormone receptor positive which means that the initial treatment is followed by an anti-hormonal pill called tamoxifen. There is a lot that is still unknown as most clinical trials do not include men with breast cancer. Breast cancer is a reality, so if you feel a lump don't be macho and ignore it. Go see a doctor as early detection can lead to a cure. Now four years out from his treatment, Dr. Bogler looks back at the bittersweet journey: the highs and lows. "Cancer changes everything" is not just a buzz phrase for him. It has inherently changed the way he views the world. The dark clouds of breast cancer came with a silver lining: the shared experience of living through cancer made the bond between him and his wife stronger than before as now he truly empathized and understood what she had gone through. He learnt that cancer was not something one can "get over" and then "move on" as it fundamentally changes life and its priorities. Now, in addition to work he enjoys spending more time with his family, cherishing every single day. His advice for men: Breast cancer is a reality, so if you feel a lump don't be macho and ignore it. Go see a doctor as early detection can lead to a cure. Dr. Oliver Bogler, PhD is the Senior Vice President Academic Affairs, Vice President Global Academic Programs and Professor Neurosurgery - Research at UT MD Anderson Cancer Center. He is spreading awareness about this rare disease through his blog.